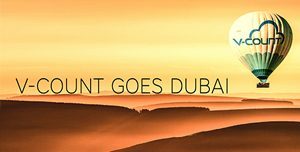 No Comments on V-Count is proud to announce the opening of one more office, this time in Dubai! Our established network in the city and Dubai’s strategic location and dynamic, tech-savvy market makes it the ideal location for V-Count‘s new offices. This move is part of company’s continuous effort to expand its presence, and respond to the growing demand for advanced people counting solutions and retail analytics. The new offices are located at One Central The offices 1 01.03 Po Box:9821 Dubai World Trade Center.